Web Design Leamington Spa : Public Marketing Communications : What colours should I use on my website? What colours should I use on my website? When we’re designing a new website for a business, we consider aspects such as layout, navigation and responsiveness (i.e. how content will be displayed on different devices). Another very important consideration is colour. The colours featured in your web design can have an impact on how users feel about your business. When we’re working on a colour scheme, we consider existing business branding. The colours must be consistent with your overall brand. If your colours don’t translate well to your web design, perhaps you should consider a re-brand. You should also think about your audience and what colours will appeal to them. Different colours will appeal to different age groups and genders. Using customer personas may help you determine who your audiences are. 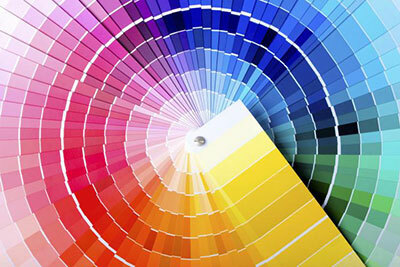 First and foremost, colour will help to make your website visually appealing. The more attractive and user-friendly your website is, the more likely visitors are to stay there (and ultimately buy your product or service). First impressions count, so you need ensure your web design colours give customers a positive feeling about your business. Colour can also impact the readability of information on your website. No matter how interesting your content is, if the text and background colour combinations make it difficult to read users will get frustrated and leave your site. So it’s important to use colours that are easy to focus on and make your text stand out clearly. For this reason, we usually use a dark text on a light background. Another reason why colour is important is that it can evoke certain emotions. It may sound strange but research has found this to be true! Colours can have an impact on what people think, how they feel and what actions they take - so it’s essential that you use colours that evoke the right emotions. To give you an idea of how this works, here are the colour meanings of some of the most popular colours used in website design. Blue is regarded as a safe, trustworthy and reliable colour, which is why it is so commonly used in business web design. In fact we use it for our own website and branding! It’s reported to evoke feelings of calm and relaxation, highlighting the business as reliable and experienced. Just think of some of the most trusted brands: PayPal, Barclays Bank and Ford. Red is strong, dynamic and passionate. It’s often used on ‘Sale’ signs on websites as it creates a feeling of urgency and excitement. It’s thought to encourage customers to complete a call to action. Orange is seen as warm and energising. Sainsbury’s has been using orange as its brand colour for decades. It’s considered ‘friendly’ and will invite users to complete the call to action on your website, rather than making them feel like they must do it immediately. It’s useful for highlighting call to action buttons like Subscribe and Follow. Green tends to inspire people and make them feel optimistic. Green is also an obvious colour choice for businesses needing to highlight their environmental values and credentials. See Oxfam and Waitrose as examples. Purple has connotations of wealth and luxury, which is why it is often used by ‘high end’ businesses. It also has a slightly feminine and romantic feel, making it popular with beauty, fashion and luxury goods websites. If you’re going to use purple, it might be better to use small hints so it’s not too overpowering. Asprey and Hallmark both use hints of purple to great effect on their websites. Colour is essential to web design but white plays a crucial role too. White space lets your content ‘breathe’ and makes it easier to read. Some people don’t like white space in their own marketing materials and web design, thinking they need to fill it with something! But white space will prevent your content from becoming cluttered and will give your website a more professional and user-friendly feel. Countless eCommerce websites use plenty of white space, like House of Fraser, the BBC and Google of course. If you need advice or tips on best practice for website design, feel free to drop us a line.